Climbing Theatre of Shadows was one of the highlights of my recent trip to the City of Rocks in Idaho. The worst part was my car completely dying on the way home, but that is for another blog post. 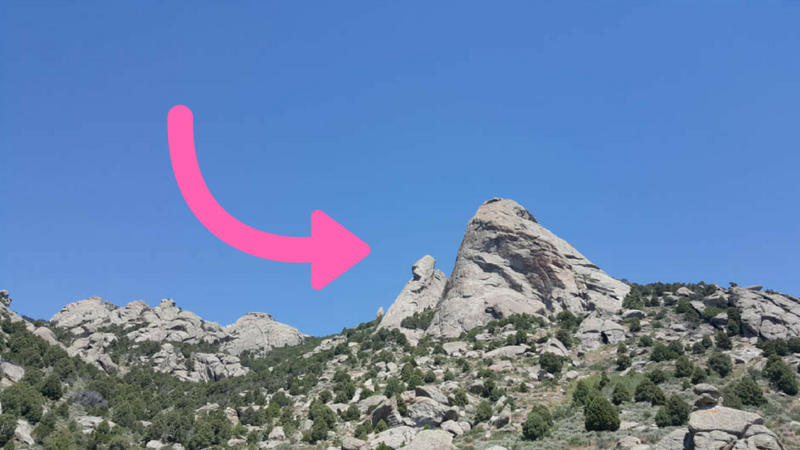 City of Rocks is a high elevation desert (around 6,000 ft / 1,800m). You have to get up extremely early to beat the summer heat. This is what 4:45am looked like from our campsite. It turned there was some stiff competition for the route, even at this time of day. The approach should have taken about 30 minutes. But a truck full of other climbers arrived at the parking lot minutes after we did. So we sort of ran up the hill, arriving totally covered in sweat. Stopping to breathe for a second. Theatre of Shadows is a multipitch climb. When you see people climbing in a rock climbing gym, they go up to the top of the wall and then get lowered down. This is a single pitch of rock climbing. On a multipitch climb, the wall is so tall that you cannot do with one piece of rope, or in one pitch. Thus … multipitch! Kara, Brianna and I more than halfway up the climb. In a multipitch climb, each person in the group takes turns climbing and managing the rope for the other climbers. This means you end up hanging out on the rock wall for a few hours … or more if you’re on a big wall climb. Theatre of Shadows had four pitches. The route is about 500 feet long, which is roughly equivalent to a 50 story building. The climbing was very easy (5.7). It was a perfect climb for a people who wanted to focus on multipitch systems and not worry about the climbing. When we were climbing, we ran into a bit of a traffic jam. I ended up having to hang out at the top of the second pitch for a while with my friends were below me. The view was beautiful, so no complaints. After the crowd cleared, Kara climbed up. And she belayed up Brianna. As the newest climber of our trio, we sent Kara off to lead the most exciting part of the climb. There was a bit of exposure as you moved around a ledge. Fun! I led the last pitch, which was almost just hiking, as you can see from Brianna standing below on a ledge. But still super fun! Multipitch climbing is usually done with two people, but it is possible to do with three as well. Since it our first time doing it with three people, we carefully planned things out the night before. We wanted to make sure we were prepared so we could move as quickly as possible. Brianna is putting away one of the ropes at the end of the climb. Then it was time to go down! Kara and Brianna had a run time rappelling together. I went down after them on my own. It was a free hanging rappel, which meant my feet were not touching the wall. Fun! We did not really end up beating the heat, due to the traffic jam and our later start. We went to “town” on the way back to camp for ice cream and air conditioning. I also bought this bag of ice just to sit with it in my lap for about 30 minutes until I felt normal again. Two days later, we climbed the nearby and slightly harder route called Sinocranium. Bernard joined me, so we made two pairs of two. The hardest pitch was labeled “tough for the grade” in the guidebook. So we had to decide who would lead that pitch. Leading means you go first and set up all the safety gear for the second climber. If you slip while you are lead climbing, you will fall much farther than the second person will. So it can be a bit intimidating. Kara and I are more hesitant climbers than Brianna and Bernard, so we made sure we challenged ourselves and took responsibility for that part! Bernard climbing the hard pitch. It ended up being incredibly fun. It required some athletic moves but was very safe. The handholds on the right-hand side were all these super cool quartz crystals, which was my reward for dragging myself up there in the blazing sun. Another great trip with the Alpine Club of Canada Vancouver Island section!